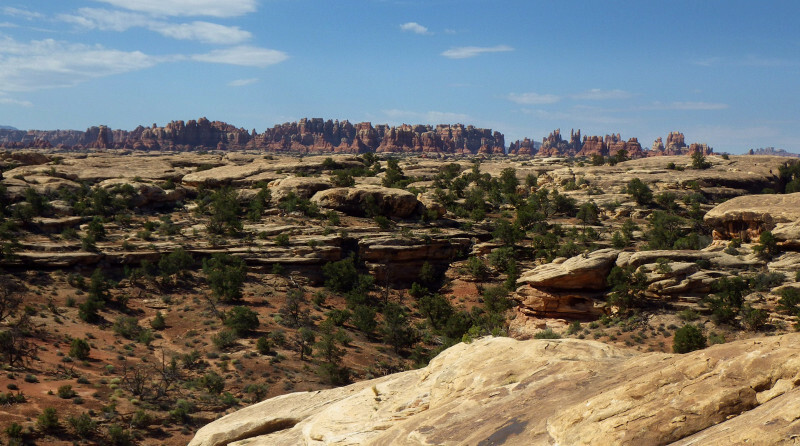 The Confluence Overlook Trail – Across Utah! 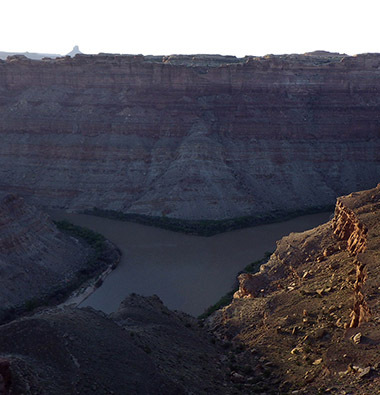 The Confluence Overlook Trail is an approximate five-mile trail (each way) to an outstanding viewpoint overlooking the confluence of the Colorado and Green Rivers in the heart of Canyonlands National Park. At certain times of the year each river flows a different color and the mixing of the two rivers at the junction makes for an incredible spectacle. In summer it will be really HOT and one won’t find any water along the way. The route looks flat on paper, but in reality it requires a bunch of up and down travel and even minor scrambling as it crosses multiple canyon systems. 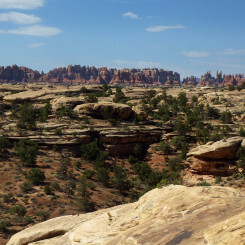 A rough Jeep road follows an alternate route and also allows access to the viewpoint w/o the long hike. However, the Elephant Hill portion of this road is very rough. 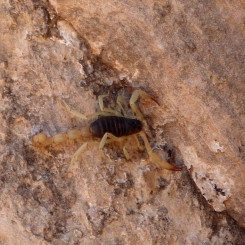 Snakes and scorpions are frequently seen along the trail. The two rivers are frequently the same color and thus the amazing spectacle described above is not visible all the time. The last point is a major disappointment for many. 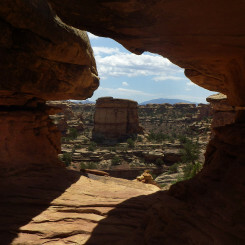 Though the “normal” view is still great, many may find it not worth the effort of the long day-hike with so many other great views nearby with easier access. Check with the Visitor Center regarding possible conditions. Long-distance hikers (eg Hayduke Trail adventurers) shouldn’t miss the easy diversion if in the area however. 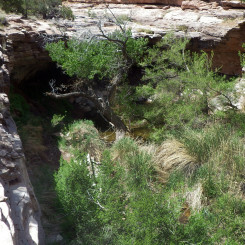 The trail begins at the Big Spring Canyon Overlook at the end of the road in the Needles District. 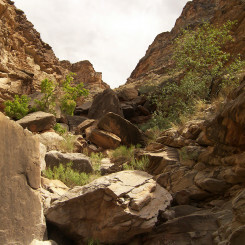 The route immediately dives down into Big Spring Canyon just above a dryfall which prevents access to the spring below*. 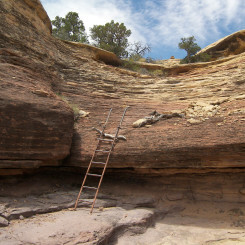 The route then climbs out the other side before passing through a small arch and climbing a ladder to get up a slickrock gully and access higher ground and a wonderland of weirdly-shaped rocks. 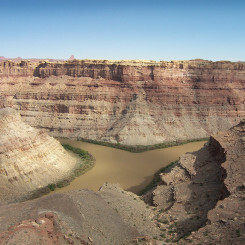 *Note: long-distance hikers can follow the eastern rim north to a spot where it is possible to downclimb about 10′ and access the water below. The route climbs up out of Elephant Canyon and makes its way through a jumble of fins/rocks with occasional great views south to the Needles. 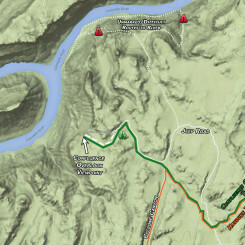 The route descends again at about the 3-mile mark and intersects a Jeep road. Don’t follow the road, but instead cross and continue along the trail as is climbs up again to a small plateau. 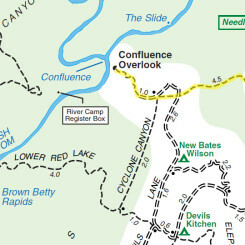 In less than another mile the route will drop back down and reconnect with Jeep road near the northern end of Cyclone Canyon. 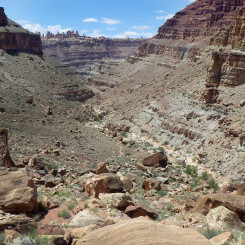 From here the trail climbs up a slight incline before topping out in about 1/2 mile at the rim of the canyon and a view of the confluence. 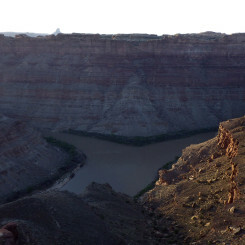 Be careful here — there are NO guardrails and it’s a several-hundred foot drop off the upper cliffs. 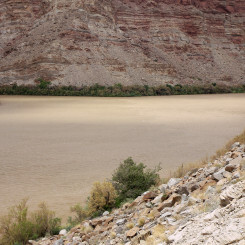 The views to the north are of the confluence and to the south of the now-larger Colorado River flowing down toward Spanish Bottom and Cataract Canyon. There is no way down to the river from this point. 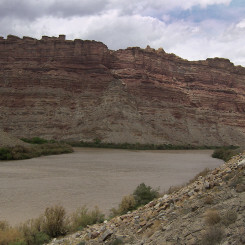 However, for those who *really* want to get down to the Colorado, there is access via difficult/steep routes a little farther to the north. 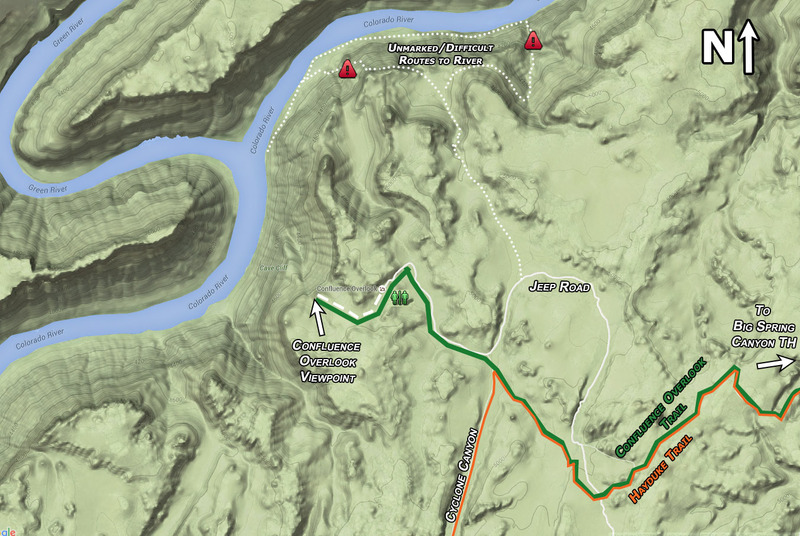 It would be possible to make a loop down to the river and then climb back up via the Red Lake Canyon Trail route. This is too much for a day hike though, so one would need to secure the necessary overnight permit. 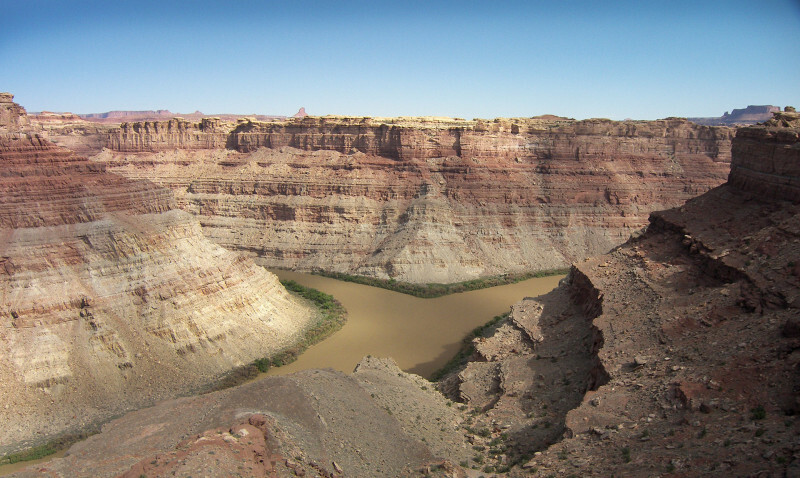 Tagged Canyonlands, Colorado River, Confluence Overlook, Green River, Hayduke Trail, Red Lake Canyon, Spanish Bottom, The Needles, Utah. Thanks for all the info. Your site helps expel any doubts in some cases about various areas. I especially liked Burr loop- and as you said at end: one need not do the whole hike just to see the various highlights- as can be done from trailheads, etc. 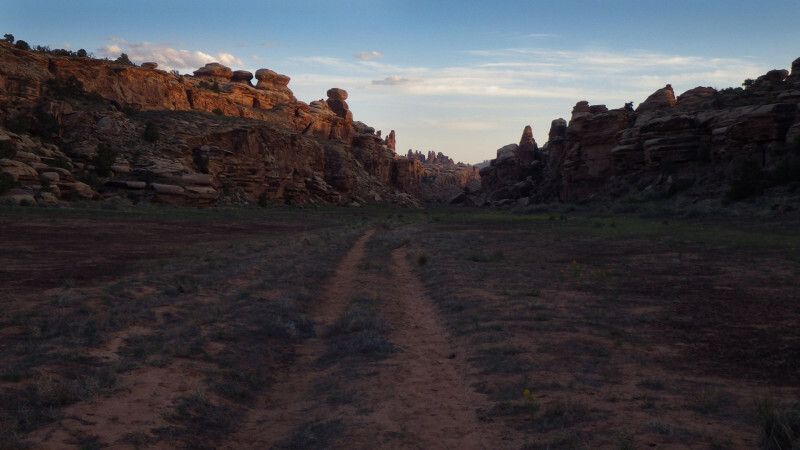 Did not know about you before 2012 when I was around the east Escalante area, Could have done some more better hikes. 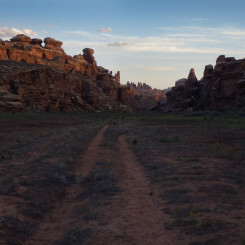 Like off Long gulch road, or near Circle Cliffs, etc. Kudos to you!